Danny Peterson | 11/14/2018, 9:55 a.m.
Portland City Commissioner Chloe Eudaly (left) and Portland City Commissioner-Elect Jo Ann Hardesty (right). 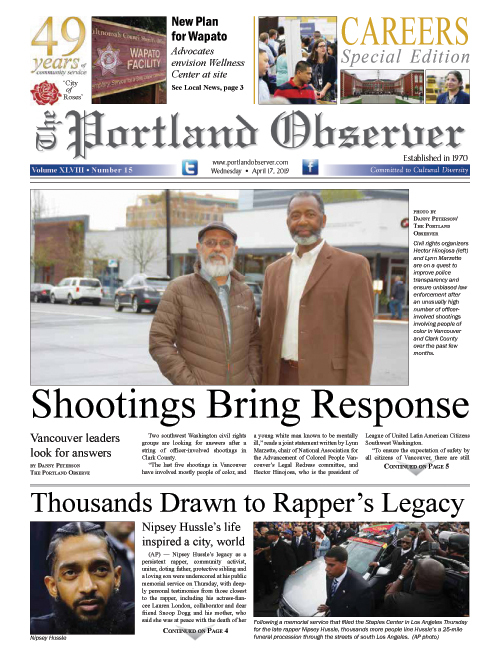 Portland Mayor Ted Wheeler’s proposed ordinance to give the city more power to curb potentially violent protests ran into opposition from incumbent City Commissioner Chloe Eudaly and City Commissioner-elect Jo Ann Hardesty Thursday when the ordinance saw its first hearing. The regulation would grant the mayor power to designate where and when protestors can gather under certain circumstances: If the groups have a violent history; when bystander or protestor safety is at risk; or if there is otherwise evidence of likelihood of violence to take place. Dan Saltzman, who is retiring in January, was the only City Commissioner to voice support for the measure. The American Civil Liberties Union of Oregon and other civil rights advocates argue the proposal has the potential to infringe on Constitutionally-protected speech and assembly rights and lacks meaningful oversight for abuse. Police Chief Danielle Outlaw spoke in favor of the measure, citing public safety needs. She said added staffing for recent protests that have grown violent have cost taxpayers over $440,000. Hardesty, who became the first black woman elected to Portland City Council just two days prior to the City Hall hearing on the issue, and will succeed Saltzman, testified that Wheeler’s curbs would disproportionately be enforced against people of color. Hardesty urged postponing deciding on the proposal until after she’s sworn in, in January. She also criticized police for not telling the truth about why they resorted to using force against left-wing antifascists in response to an Aug. 4 protest in downtown Portland. The police response was also referenced by City Commissioner Eudaly in her line of questioning about past police action. The protest in question saw multiple injuries of leftist protestors, but few reported actions taken against right-wing group Patriot Prayer, despite a report more than a month later that some members of that group held weapons on a rooftop. That protest was one of many in the past two years in which right- and left- wing groups have clashed, some of which resulted in violence. “How many lawsuits is the city fighting related to police use of force against demonstrators, and how much money has defending these suits cost Portland?” Eudaly asked. Deputy Attorney Robert Taylor replied, “Thirteen, but the suits don’t cost anything to defend because the city has staff attorneys.” (Eudaly responded that had the lawsuits not been filed, the lawyers could spend their time working on other things). When Eudaly asked why police used exploding munitions and pepper spray against non-violent protestors who disobeyed dispersal orders, Assistant Chief Ryan Lee responded that disobeying such an order is breaking the law. Eudaly also wanted to know why police kettled and photographed the IDs of more than 300 left-wing protestors in July 2017; why some police told Independent Police Review investigators that far-right extremists seemed “more mainstream;” and whether any of the Patriot Prayer protestors had been injured by crowd-dispersal munitions, as Antifa protestors had on Aug. 4. Officials said pending lawsuits prevented them from commenting directly on many of the issues raised. Eudaly said she’s going to vote “no” on the proposed ordinance. While the measure was first referred to the council as an emergency, the mayor pulled the emergency clause just before its hearing and as a result, the measure could go into effect 30 days after it is passed, instead of right away, and does not require unanimous approval by the council. The measure will be taken up again on Thursday. Commissioner Amanda Fritz said she’s against the proposal. Commissioner Nick Fish has not voiced a position.